Suspension lamp with stacked cylinders of hand blown glass diffusers available in the following color combinations: Gloss white / clear crystal glass and Gloss white / wisteria. Brushed nickel metal structures. Wall, ceiling, and table designs are available. 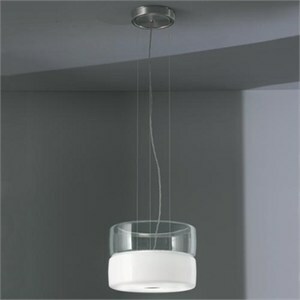 he large glass diffuser is suspended by three cables that attach to a circular canopy mount and then to a standard 4��octagonal junction box. 13.75"D X 9.75"H; fixture comes with 78.75" of wire.